A little depication of Jesus on the top of a 18th century iron cross at Petersfriedhof, the cemetary of St. Peter's Abbey. 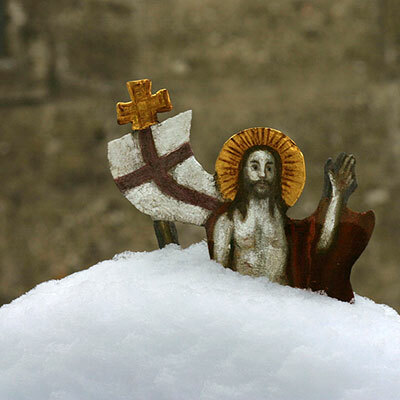 The cross was covered in snow, only this decoration on top peeked out a little on a cold winter day. The monastery is among the oldest Christian monasteries in the world and the oldest north of the Alps. It has been continuously used since the 6th century and is likely to pre-date the arrival of St. Rupert in Salzburg. Today, it is still one of the most important Benedictine monasteries in Austria and one of the top sights and tourist attractions in Salzburg.